If you are visiting Svalbard, dog sledding is something not to be missed! 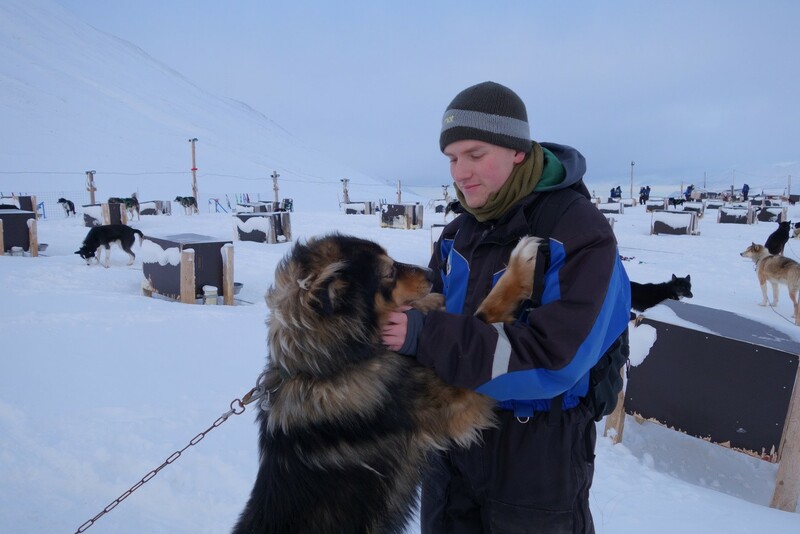 I have visited Svalbard in winter (March, the winter period is from October–April), so there is a lot of snow and you can experience true dog sledding – you get a sled and six dogs, and off you go!. 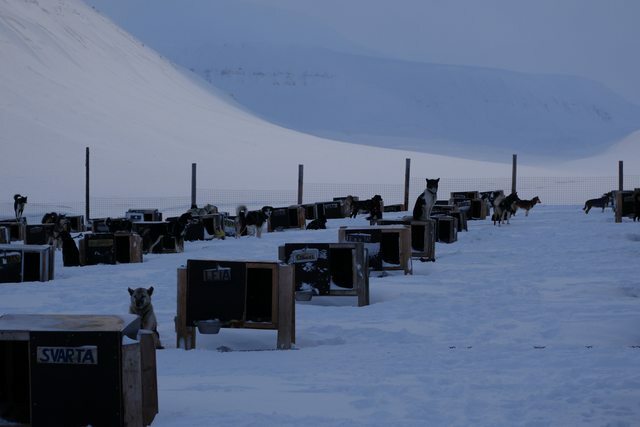 If you visit in the summer, I believe it’s still possible to go on a dog tour, except the vehicle of transport is a “sled” with wheels – there isn’t much snow in Svalbard throughout the non-winter months. 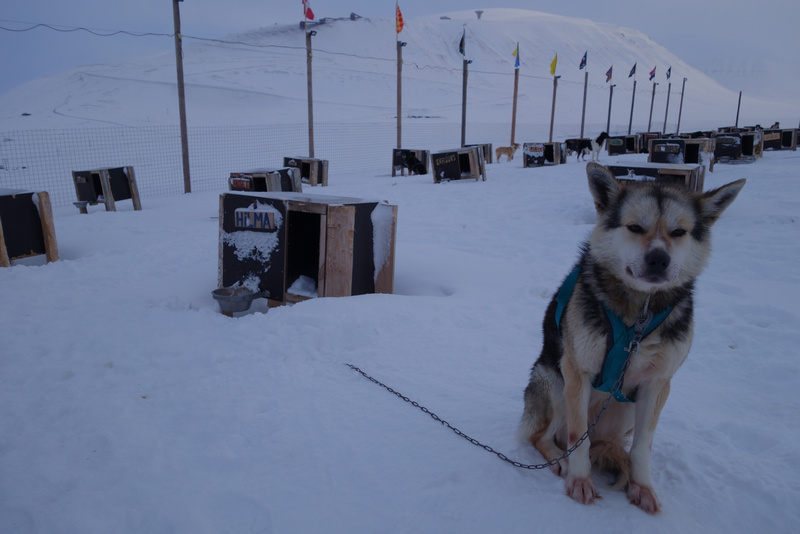 For dog-sledding, I went with Greendog due to their stellar reviews, and I have to agree with them! It’s a fantastic company that made the experience great. 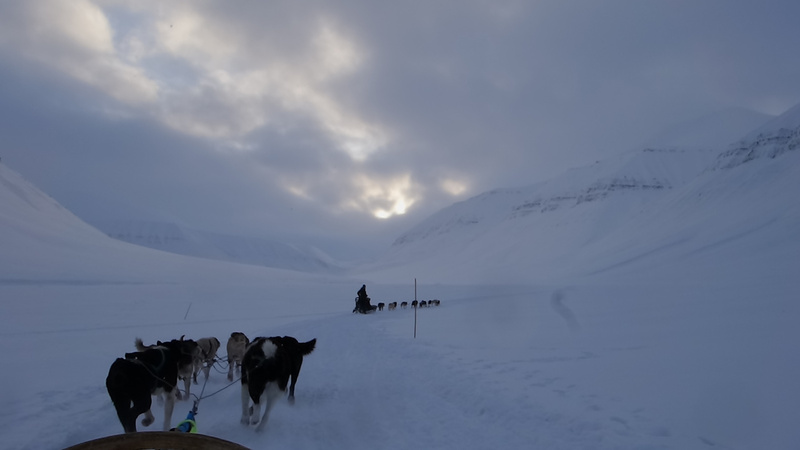 I was picked up from my hotel at 10am, and driven 12km outside of the main town in Svalbard – Longyearbyen. The final kilometer was too snowed in for the minibus to pass through, and we were shuttled in a Jeep to the Greendog base. Upon arrival, we dressed into scooter suites (a very warm windproof and waterproof suite), Sorel snow shoes, and put on gloves and warm hats. 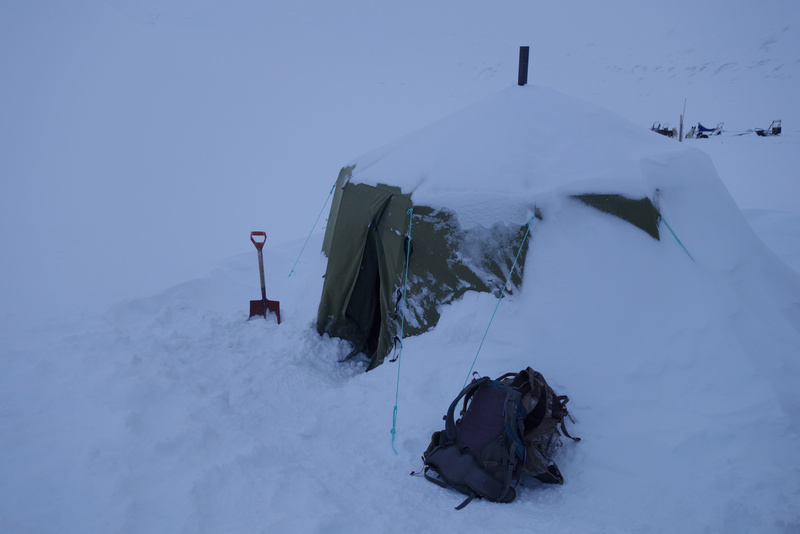 All the required gear is provided, so it’s not necessary to have extremely warm or heavy duty clothes with you. 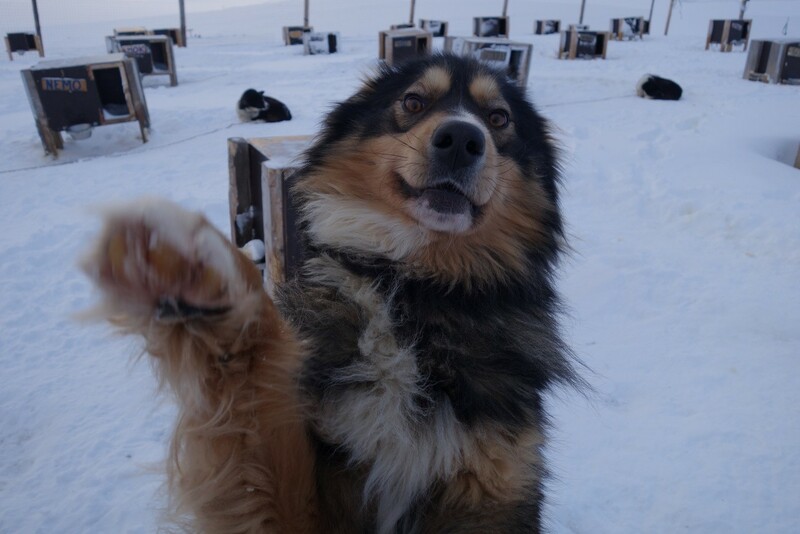 Hi, you are so fluffy! 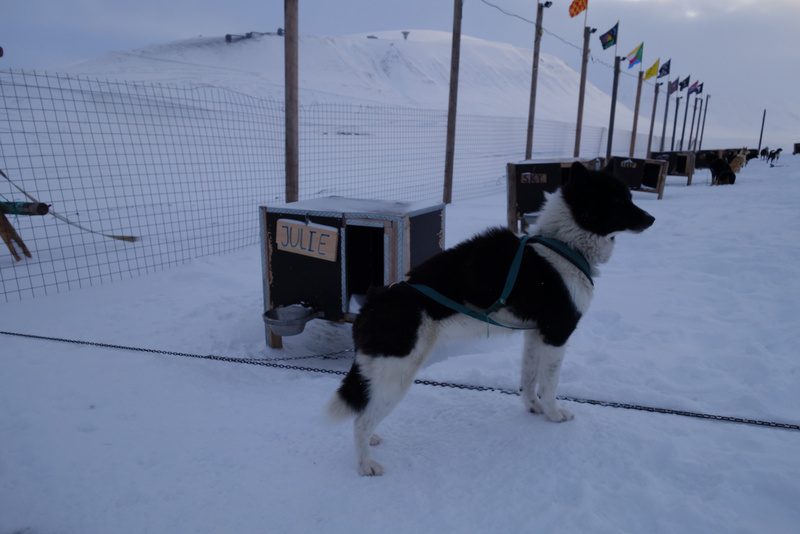 Before leaving off, we got a chance to play with the dogs – there are over 120 of them! I had a look at Greendog’s website, and every dog has its own profile and picture, which I found very cute. 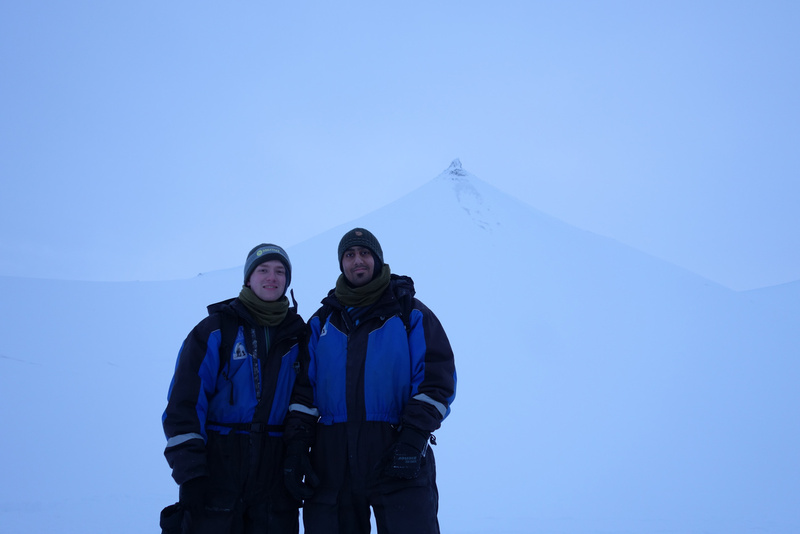 After a while, we were assigned to teams of two people per sled – I went with a friend I was traveling with. Each team gets six dogs – the two front dogs, the lead dogs, are the most important. 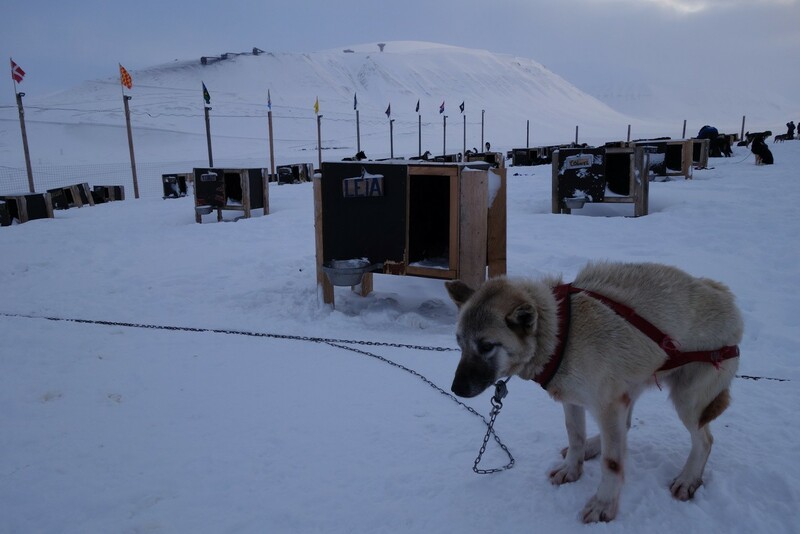 After the dogs are born and before they start sledding, the carers figure out which ones seem to like each other and work well together. The pairing is important. 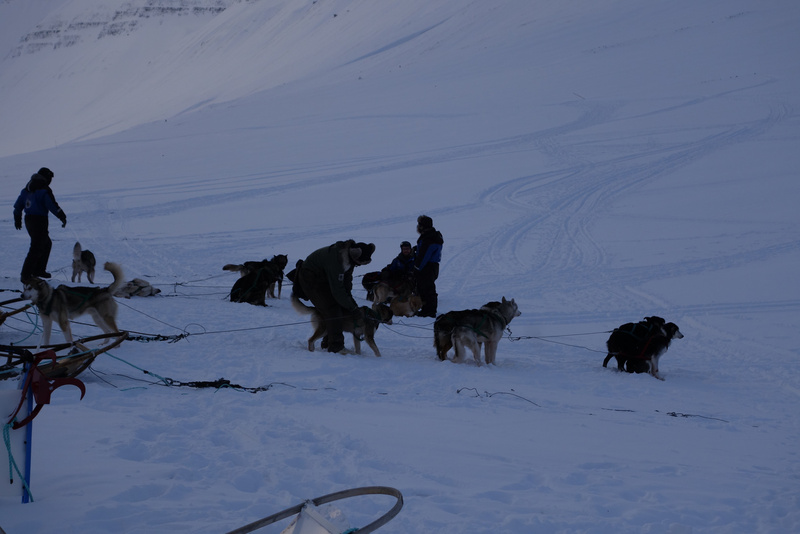 We were given a short intro on how to operate the sled (how to use a break and the anchor), and then off we went. There is no directional control involved since the dogs simply follow the dogs in the front, with the very first sled being in control by a guide who I presumably does know how to control which direction the dogs go. 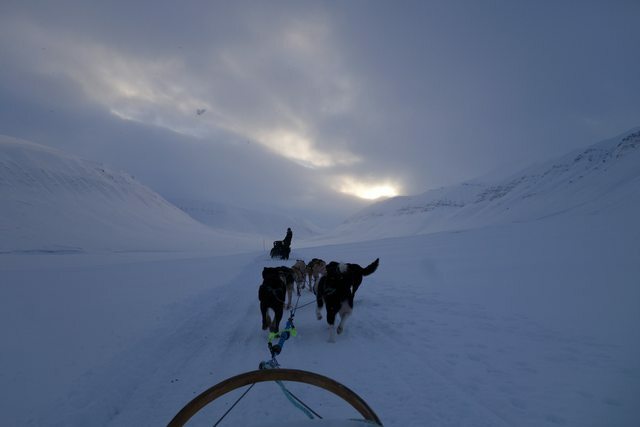 One person sits on the sled as the passenger, and the other stands on the two runners at the back with the break in between their feet. 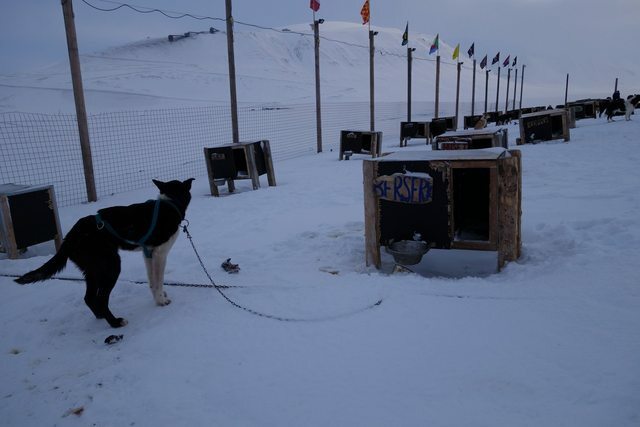 As soon as you let go off the break, the dogs run and you start going. You control the speed by by using the break. 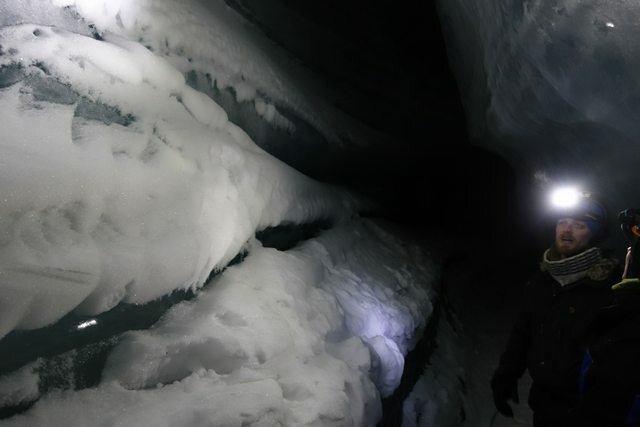 If it’s a steep incline, you might need to get off (and maybe the passenger too!) 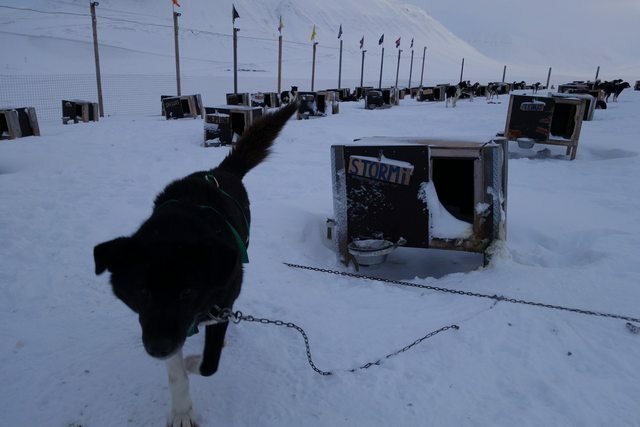 and help the dogs out by pushing the sled and running alongside. We had to do that a number of times and it was quite a workout! 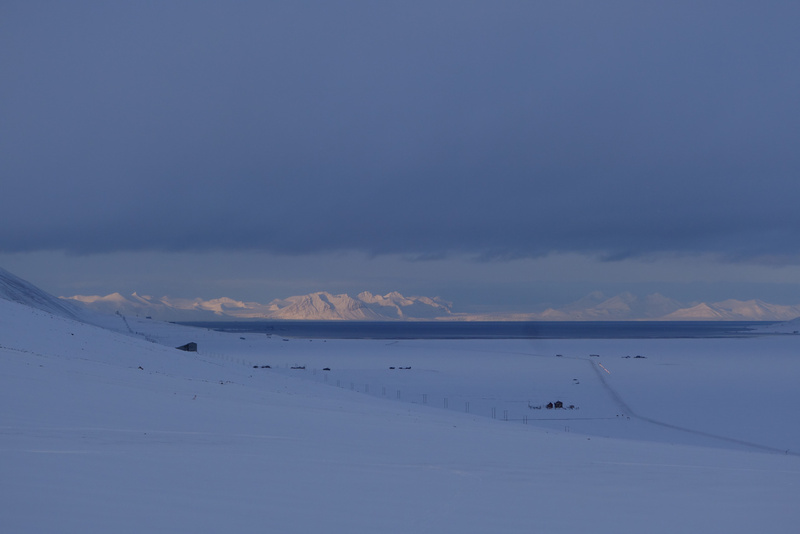 Some truly awe-inspiring landscapes. 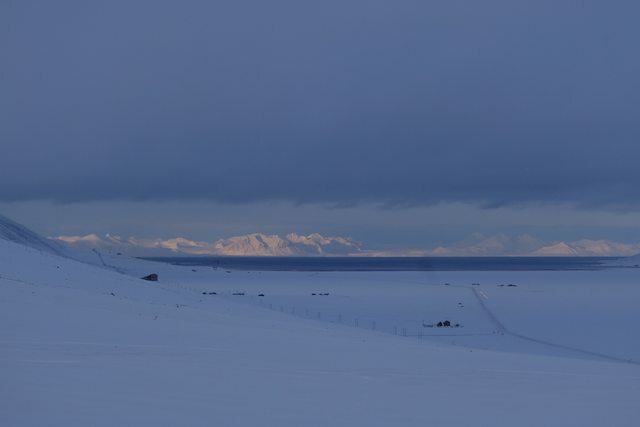 Realizing that on this landmass of 65,000 squared kilometers is only around three thousand people (and around two thousand polar bears!) really makes you appreciate this barren nature. 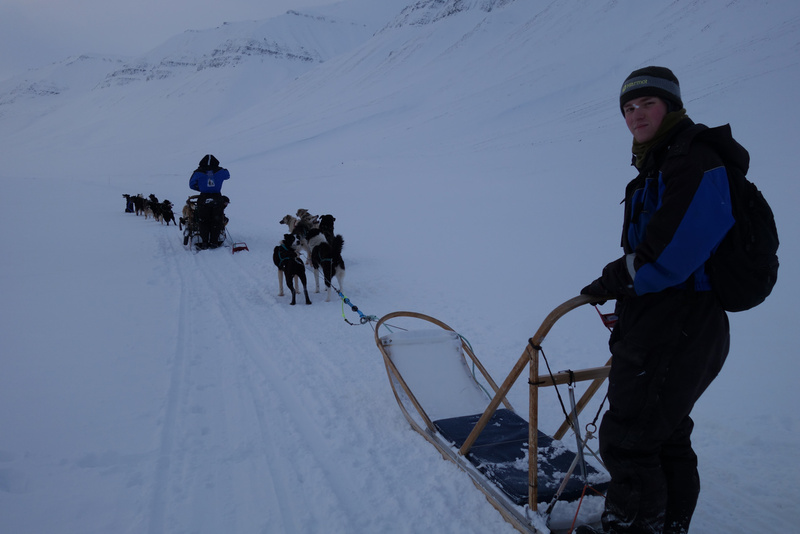 Me on a sled. 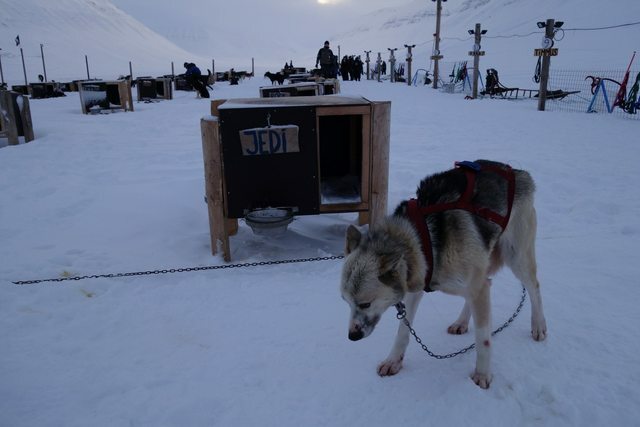 The sled is wooden and quite simple, but very sturdy. 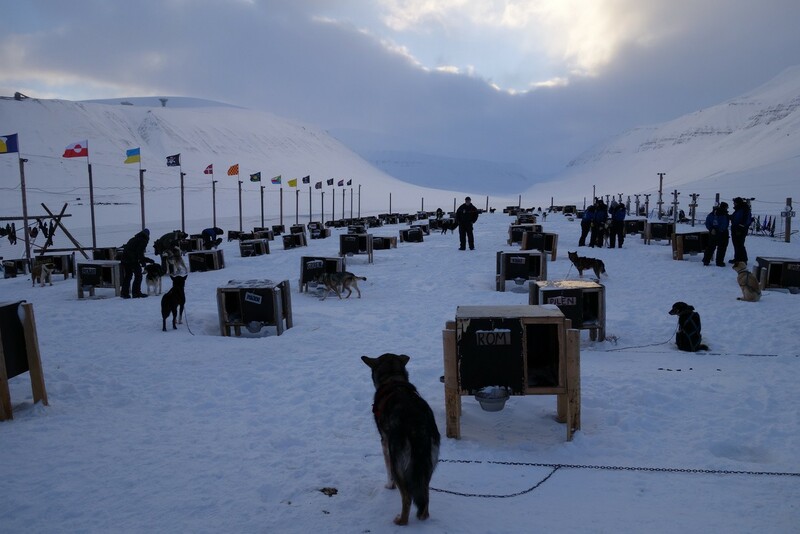 Halfway through the trip we stopped for a field lunch. It was a spaghetti carbonara, but not your ordinary one – you shake up this silver packet, add two cups of hot water, stir, and wait a couple of minutes. Perfect after a tiring workout while going through the steeper hills with the dogs. 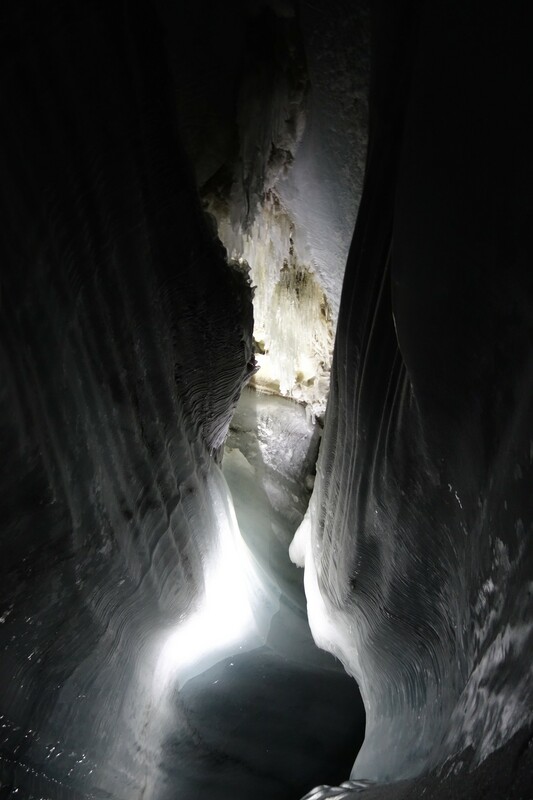 After lunch, we went to explore an underground ice cave which was rather remarkable. The way back was mostly all downhill, and took twice as fast as the route we took in the morning. This time I was the passenger – I sat in the plastic seat designated for the passenger, breathed in the Arctic air, and let myself be pulled by a team of six fantastic dogs through the magnificent Svalbard landscape. I can only highly recommend you go for a dog-sledding tour here. Coming back from a tiring and eventful day. 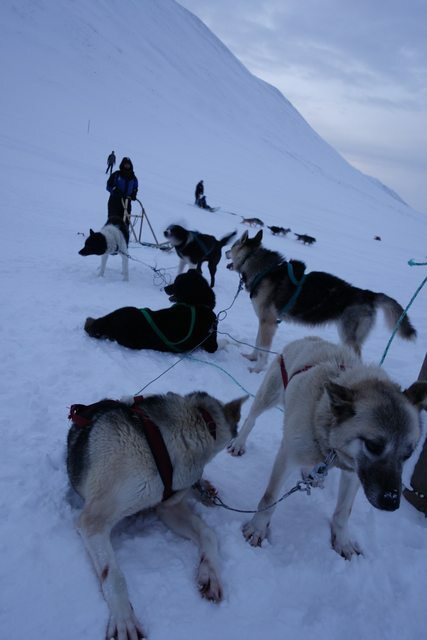 Dogs ready to be unharnessed and to go rest after a tiring day.